THE ADDRESS Magazine is an elegant lifestyle publication that shares its reader’s discerning tastes for living the good life. From dazzling coverage of some of the world’s finest homes for sale to inspirational travel features and curated discoveries for the home and well-being to leading you on food trails of gastronomic uber-excellence, THE ADDRESS offers it all. Intelligent, good-looking and passionate about a luxury lifestyle, the magazine is renowned for its crisp and stylish design along with stunning imagery. The latest issue of THE ADDRESS Magazine presents more than 422 gorgeous, full-colour pages brimming with inspiration and information from the international luxury property and lifestyle markets to see you through winter 2014/15. A world-class trophy property rivalling the finest European estates, it is rare for a property like this to come to the market. Filled with an ethereal beauty, the unique Provençal bastide is unmatched in its natural splendour and lavish indulgence. Andalucia property is increasing in popularity and helping to drive Spanish real estate sales. The perfect weather, pretty villages and great country lifestyle appeal to many global homebuyers. There is an increasing demand from international clients for large country properties with equestrian and sporting facilities. Our curated selection of country estates in Andalucia ranges from country houses with existing stabling and land, equestrian centres, stud properties for breeding horses and working farms to olive-growing estates and private or commercial hunting estates. Madrid offers an enviable lifestyle, with its gorgeous architecture and wide choice of gastronomy, entertainment and luxury boutiques. From affluent suburban developments perfect for families to contemporary inner-city penthouses, the selected Madrid properties for this issue combine timeless elegance with timelessly refined style. Known around the world as the City of Lights, life in Paris is the world’s epicentre for gourmet dining and cutting-edge fashion, magnificent history and art along with an elegant and sophisticated lifestyle. If you desire the ultimate in luxury living, nothing says luxury quite like an exclusive property in one of the Paris’ most prestigious arrondissements. A city of magic and mystique, Marrakech continues to be an enticing second home destination. For those who desire to experience the rich lifestyle of the city, living here and owning a Marrakech home puts luxury on a completely new level. This issue of THE ADDRESS Magazine brings some of the most exclusive real estate, luxury homes and properties for sale in and around Marrakech. So much to offer the discerning investors and lifestyle buyers, do not miss Europe’s first residential country club located in South of France. At the heart of the site lies a magnificent 400-year old chateau, which will be lovingly restored and will open as a 5-star internationally branded hotel. There will also be an 18-hole International golf course, luxurious spa complex and a fine dining restaurant onsite as well as a plethora of local attractions including beaches and skiing nearby. The luxurious residential golf development comprises a selection of spectacular homes. These modern properties are well-appointed and tastefully designed, making them valuable assets for investors, and excellent options for holidaymakers seeking comfortable, elegant accommodation. 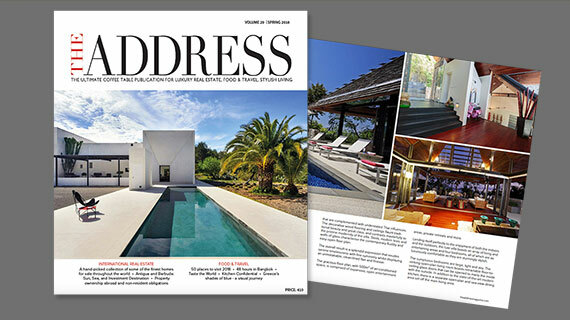 In addition, this issue of THE ADDRESS Magazine also includes a pièce-de-resistance property on Costa Blanca, a grandiose estate on the French Riviera, a superior beach residence in Costa Rica, stylish mountain homes in the French Alps, a waterfront residence in Liguria along with several other fine homes for sale. The market insight features in this issue include “Spanish inheritance tax and 2014 EU ruling rebates for non-residents?”, “Trust France” and “Buying property in Indonesia”. THE ADDRESS Food & Travel section features fascinating travel destinations, luxury getaways and incredible restaurants with a difference. In the article “Caribbean Chic”, we are looking for an inspirational slice of island life in Grenada, St Lucia and St. Kitts & Nevis. For those who are looking for an extra special dinner recommendation, read our article about the world’s ten most expensive restaurants. These hot spots offer more than meals; they offer once-in-a-lifetime dining experiences. Michelin-starred chef patron Nigel Haworth sits down with THE ADDRESS Magazine to talk about food inspirations, most admired chefs, favourite ingredients and much more. Boasting a premier location, this charming chalet captures an amazing alpine panorama including the spectacular Massif de Mont Blanc.